Product information "negative rake scrapers"
HOPE negative bowl scrapers. Excellent for final finishing and shaping. Tips are made from M42 and work by adding a cutting burr from the underside. Very stable due to the negative rake or angle! 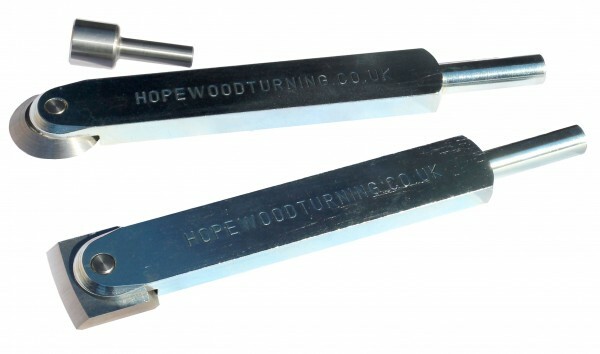 Fits into any Hope 16.5mm quick or grub screw handle. Round and convexed cutters available. Round cutter comes with a sharpening mandrel. SIZE OF BAR IS 35MM WIDE, X 15MM THICK, X 265MM LONG INC 55MM TANG. CONVEXED CUTTER IS APPROX 48MM SQUARE. ROUND CUTTER IS APPROX 48MM DIA. Related links to "negative rake scrapers"
Customer evaluation for "negative rake scrapers"